Not settling for the three movies showing what happened to Rick Grimes, TWD showrunner is now talking about an entirely new series, and you can read about that one here and here. Want to see a trailer? Go here! "Someone knows a good thing when they’ve got it. AMC has renewed The Walking Dead TV show for a 10th season. " Andrew Lincoln, who left The Walking Dead series in the latest episode will remain a part of the franchise in a series of movies which will air on AMC. "There is more story to tell and we'll be telling it." Those are the words of The Walking Dead chief content officer Scott M. Gimple, Andrew Lincoln — following his departure Sunday fromthe flagship series — will reprise his iconic role as Rick Grimes in a series of three big-budget, feature-length TV movies, with production set to begin in 2019. Still to be determined is an air date and where the movies will film as Lincoln departed The Walking Dead in order to spend more time with his family in England. Gimple says. "Right now, we're working on three but there's flexibility in that. Avi Nash and Callan McAuliffe, who both arrived in season eight as Siddiq and Alden, respectively, have been upgraded from recurring to series regulars for the upcoming ninth season of the zombie drama. Nash and McAuliffe's promotions to regular follows an eighth season that parted ways with series regulars Riggs (Carl) and Steven Ogg (Simon), who played Negan's right-hand Savior. AMC announced today that The Walking Dead has been renewed for a ninth season. The good news comes during the show's winter break as fans await its return to see how the death of an original character will play out after they were bitten in last month's mid-season finale. A change in showrunner is being made for Season 9, as longtime writer Angela Kang will take over for Scott M. Gimple, who has been at the helm of the show for the past five seasons. Gimple will still be involved with series though, as he is taking the role of Chief Content Officer, overseeing both The Walking Dead and its spin-off Fear The Walking Dead. Look for Season 9 of The Walking Dead this fall. For now, Season 8 is set to resume the back-half of its run on February 25. The Walking Dead season 8 will premiere on October 22, 2017 on AMC. New 5 min trailer released @ Comic-Con last week! The roles of Laura and Arat have been filled by Lindsley Register and Elizabeth Ludlow, respectively. The roles are both key members of Negan's group, comparable to those of Simon and Dwight. AMC announced this evening that The Walking Dead has been renewed for an eighth season. The good news comes one week ahead of the much-anticipated Season 7 premiere that has fans anxiously awaiting the big reveal of which character met their fate at the hands of newly-introduced villain Negan. The long-running drama has continued to maintain its prime time dominance, garnering ratings that rank it as one of television's top series. That streak should continue with Sunday's return thanks to last season's cliffhanger ending. Another 16 episodes have been ordered for Season 8 of The Walking Dead, which will see the comic book-based series surpass the 100-episode milestone with its premiere episode in 2017. The Walking Dead's most vicious villain has been cast, as Jeffrey Dean Morgan has signed on for the role.The search for the character's actor has been extensive, and went back to last year as the TV show approached his arrival according to the comic book's timeline.The sixth season finale of the AMC drama will introduce the villain. As if there was ever any doubt, AMC has officially announced that The Walking Dead has been renewed for a seventh season. 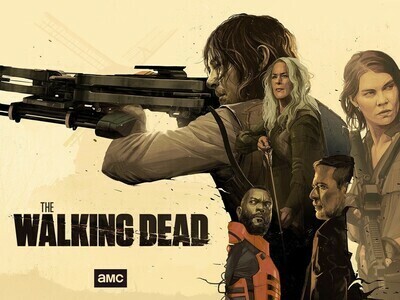 The Walking Dead has been the #1 show on television among adults 18-49 for the last three years.In addition, AMC has renewed “Talking Dead,” the live after-show hosted by Chris Hardwick. The spin off to The Walking Dead finally has a title!!! Fear The Walking Dead. Set to premiere on AMC this Summer, series is set in Los Angeles and focuses on a new set of characters in the early days of the outbreak. Click the link to view the first official trailer. AMC is moving forward with their Walking Dead spin-off. The untitled “companion” project, which has been in the works at the network since 2013, has been officially green-lit to series with a two season order. Six episodes have been ordered for the show’s first season, while the episode order for the second season has yet to be determined. Set to premiere on AMC this Summer, the untitled series is set in Los Angeles and focuses on a new set of characters in the early days of the outbreak. Further plot details for the series have yet to be announced. During ShareTV's Exclusive Interview with Josh, he opens up about the audition process, the name of his mullet, and what we can expect from the next episode of The Walking Dead. Read the exclusive interview here! The Walking Dead is killing it! The fifth season premiered last night to record ratings of 17.3 million viewers. The episode had a 7% increase in ratings from the previous record holder, last year's premiere. AMC projects that in a week, the viewing could hit 22 million viewers. Read more details here.